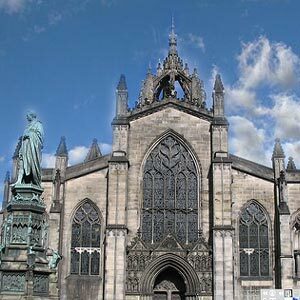 St. Giles Cathedral in Edinburgh is also called the 'High Kirk of Edinburgh' and is a Presbyterian place of worship. The four pillars at the Cathedral date back to approximately 1120. The Cathedral was officially consecrated by the Bishop of St. Andrews in 1243. It was named after St. Giles, a saint popular throughout France, in support of the Auld Alliance of Scotland and France against England. After the Reformation, John Knox became St. Giles' first minister. It is believed that there was a church on the site of the cathedral. The Church that once stood on this site had been destroyed by a great fire in 1385. Over the next 150 years, it was rebuilt and many chapels were added, one of which houses the relics of Saint Giles. The east end of St Giles cathedral has exquisite stained glass windows that frame the high altar. The church came to be known as a Cathedral during the later reign of the ill-fated Charles I. The new addition to the cathedral during its renovation is the Burns Window in 1985, showing themes from the poetry of Robert Burns. The restoration of St Giles Cathedral in Edinburgh involved new stained glass windows that depicted the crossing of the Jordan as well as well as the Life of Christ cycle.